As the somber news of the death of Apple visionary Steve Jobs echoes through every corner of the Internet, where talk of Macs and iPods and iPhones and iPads abound, Disney fans mourn the passing of the man without whom Pixar would never have existed. In 1986, it was Jobs who purchased Lucasfilm's computer graphics division for $10 million to form Pixar. Initially a struggling computer hardware company, Pixar eventually found its niche in digital animation, ultimately partnering with Disney to produce Toy Story, A Bugs Life and a host of immensely successful computer animated films. When Disney bought Pixar in 2006, Jobs became Disney's largest shareholder and joined its board of directors, a position he held until his death today at age 56. Disney and Pixar both issued statements honoring the memory of this great creative innovator. 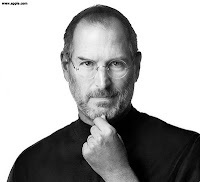 ‎Steve Jobs was a great friend as well as a trusted advisor. His legacy will extend far beyond the products he created or the businesses he built. It will be the millions of people he inspired, the lives he changed, and the culture he defined. Steve was such an 'original,' with a thoroughly creative, imaginative mind that defined an era. Despite all he accomplished, it feels like he was just getting started. With his passing the world has lost a rare original, Disney has lost a member of our family, and I have lost a great friend. Steve Jobs was an extraordinary visionary, our very dear friend and the guiding light of the Pixar family. He saw the potential of what Pixar could be before the rest of us, and beyond what anyone ever imagined. Steve took a chance on us and believed in our crazy dream of making computer animated films; the one thing he always said was to simply 'make it great.' He is why Pixar turned out the way we did and his strength, integrity and love of life has made us all better people. He will forever be a part of Pixar's DNA. Our hearts go out to his wife Laurene and their children during this incredibly difficult time. The Mouse Castle extends its sincerest condolences to the family and friends of Steve Jobs. Disney Classics in 3D: Stop the Madness!